After having 4th EP with Berlin artists Sierra Sam & Pascal Hetzel, 5th EP of “Sound Of Vast’‘ also comes out with another duo “The Jaydes” from Berlin underground. “The Jaydes” is duo project of “Bloody Mary & Attan” as both of them are already known, and developed artist in different underground music scene, as a Duo they are try to make little bit different act which they can not do as an individual, they use vintage analog gear to make their own organic but exciting sounds, which is unique way to show how to make modern sounds with dated technology. 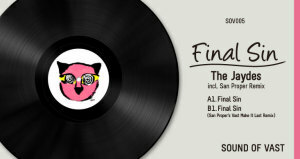 This EP “Final Sin” has the sounds that what they are searching for, you can hear typical drum machine sounds in this track which always make nice groovy on the dance floor, but with their own touch, the track doesn’t lose emotional part of the music. Also, the remix of “San Proper” is showing the philosophy of remixer and label, this track turns original track 180 degree around, you might not even recognize it is remix version of any track, very original and hot as a shix, We try to show the vast kind of house music under the name of “Goodness”.